Still under factory warranty, Carl F. Bucherer Patravi TravelTec Chronograph Chronometer on bracelet with box and papers. 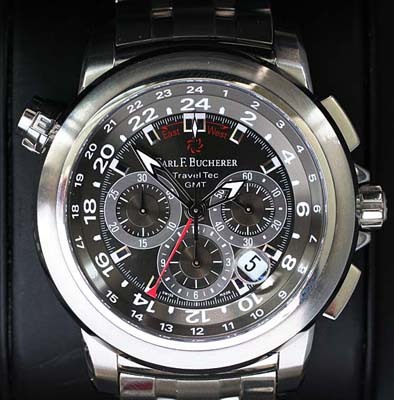 A stunning timepiece from Carl F Bucherer. The Patravi TravelTec GMT is a masterful piece of horological engineering, the watch not only functions as a Chronometer rated Chronograph, but tells time in 3 different timezones simultaneously. The watch has what we commonly refer to as wrist presence. 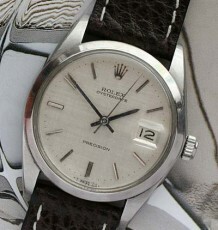 The all steel case features oversized pushers, locking collars and a winding crown. 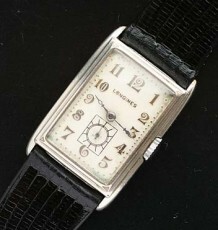 Another novelty that I have not seen before is a curved sapphire window on the non pusher side of the case, allowing the wearer to peer into the mechanism of the watch while wearing it, something not possible with a display back. 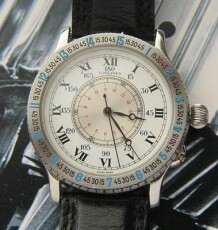 The watch comes with all boxes and paperwork including the bill of sale and International warranty papers showing it still being covered till November 2009. The watch has some minor scuff marks on the bezel and bracelet buckle that could easily buff off and one ding on the side of the top left lug. The watch has not been polished. 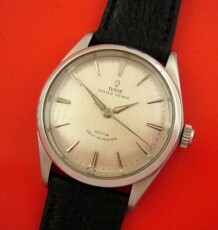 The massive steel case measures 46.6 mm wide and 16 mm high. The bracelet is also sized to fit an 8 and a half inch wrist.